WE HOPE TO SEE EVERYONE BACK IN THE FALL! UNTIL THEN, VISIT GRACE'S GALLERY! BOBBI IS IN EVERY TUESDAY AND WOULD LOVE TO SEE THE KIDDOS! 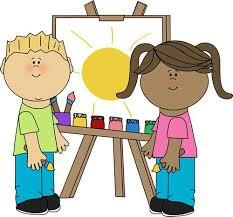 Itty Bitty Artists is designed to provide your little ones with a fun and safe learning environment. Every week we will have a different theme related play time. During Itty Bitty Artists we will read stories, explore puppets, play with theme related toys/props, create art projects, learn to play nicely with friends and share. This class is FREE for art league members, just bring your donation item. Non-members, it is $5.00/family each week plus the donation item. Please check next to the date to find out what the "donation item" will be. All children must be accompanied by a parent/caregiver. If you'd like to become an art league member, click here Art League memberships are SUPER affordable and you'll receive discounts on all other classes as well!! A family membership is just $25 FOR THE YEAR!!! PLEASE NOTE: IF MARYSVILLE SCHOOLS IS CANCELLED, SO IS ITTY BITTY ARTISTS. WE WILL ALSO CANCEL IF THERE IS A 2 HOUR DELAY. IF THERE IS NO SCHOOL SCHEDULED, WE WILL NOT BE HAVING ITTY BITTY ARTISTS. SHOULD WE HAVE TO CANCEL DUE TO ILLNESS/UNEXPECTED CIRCUMSTANCES, IT WILL BE POSTED ON THE ART LEAGUE FACEBOOK PAGE AS WELL AS ON THE ITTY BITTY ARTISTS FACEBOOK PAGE. Donation items are one item per participating child. Dollar stores are GREAT resources for finding these items and keeping this activity affordable for you & your child. If you have more than one child attending, you can always have one bring the donation item and the other(s) can always bring paper towels, tissues or toilet paper. ​**We will meet upstairs in Grace's Gallery. The first Tuesday of every month is open studio time (with no theme). ​OUR LAST CLASS FOR THE YEAR IS TUESDAY MAY 14th.